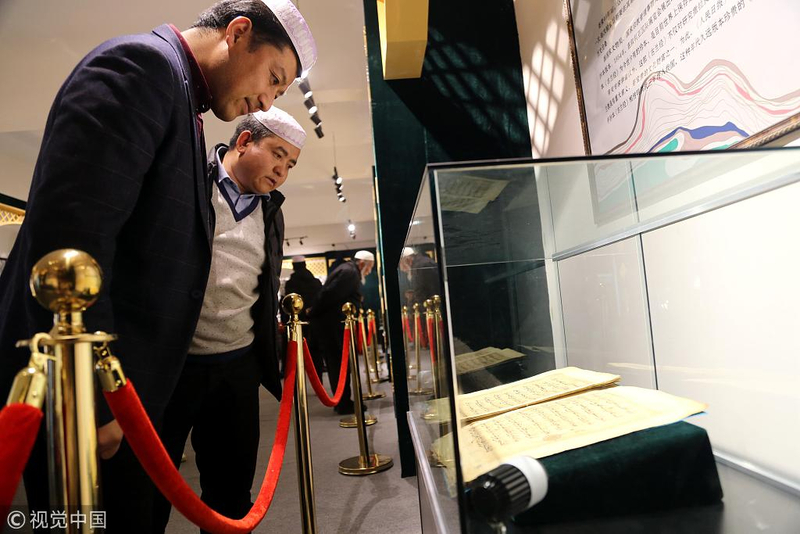 (Xinhua & CGTN) China's oldest Koran manuscript has been on display in northwest China's Qinghai Province since last month, making its debut to the public. Estimated to be between 1,100 and 1,300 years old, the Koran is considered to be one of the three oldest manuscripts in the world. The 867-page manuscript is comprised of 30 volumes and packaged in two slipcases, weighing 12.79 kilograms. Its rhinoceros skin cover is printed with beautiful patterns, while the cover of each volume is framed with blue silk. It was added to the Catalogue of National Rare Ancient Books in 2009, and underwent restoration by domestic experts in 2017. The restored book was then stored in a climate-controlled glass cabinet that features adjustable oxygen levels, temperature and humidity. According to legend, the ancestors of the Salar minority group, who believe in Islam, carried the Koran leaving their homeland in central Asia, and settled in what is now the Salar Autonomous County of Xunhua, Qinghai Province, in the 13th century. The book is currently kept at the county's Jiezi mosque. "I took my relatives with me to the exhibit. It is a treasure of our ethnic group and country," said Han Guolong, a local villager of the Salar minority group. "Seeing the manuscript, I feel deeply impressed." Every day, the exhibit attracts about 6,000 visitors, who mainly come from Qinghai and neighboring Gansu Province, where many Muslims live. Point of Correction : "Koran" is now obsolete. Qur'an is the most correct spelling. But because English words do not have apostrophes in the middle, the word Quran has become part of the English language like many other foreign source words. Qur'an or Quran is the spelling that Muslims use, and that all the best publishers use. For example Oxford University Press with “The Qur’an – a new translation" by MAS Abdel Haleem and Cambridge University Press with "The Cambridge companion to the Quran" edited by Jane Dammen McAuliffe. "Read not to contradict and confute, nor to believe and take for granted, nor to find talk and discourse, but to weigh and consider." "Every major question in history is a religious question." China is a secular state, but its citizens enjoy the most free practice to worship any religion, so long the belief does not give harm to the country and its people.